B. Sc. 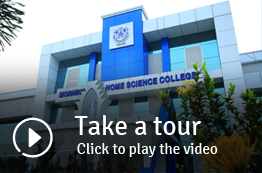 Home Science (later renamed as Family and Community Science) was the first degree course started in the college in 1968 ,with Chemistry and Zoology as subsidiaries. The course deals with the management and economics of home and community. The subject includes food, nutrition, psysiology, microbiology and health, personal finance, family resource management and planning, ergonomics, textiles science, fashion designing, housing and hospitality management, consumerism, household management, interior decoration, human development and family studies, psychology, mass communication nad journalism, extention education etc. In the 2000 M.Sc. in Family and Community Science was started. A one year Certifiacte Course in Fashion Designing for the B.Sc. students is also offered. The department offers a Certificate Course in Home Science for outside women. The department has well furnished and well equipped Food and Nutrition Lab, Biochemistry Lab, Textile and Clothing Lab, Observation Lab, Dietary Counselling Center and Residence for Cottage Stay.